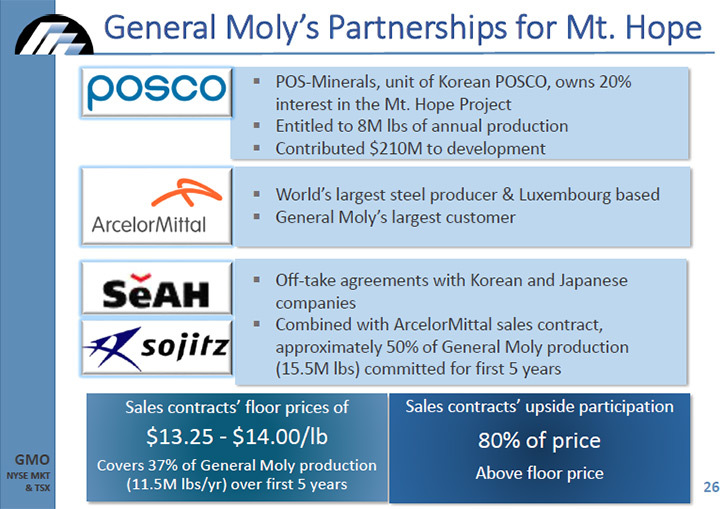 General Moly, Inc. (NYSE MKT and TSX: GMO), is a U.S.-based molybdenum mineral development, exploration and mining company with an 80% interest in the Mt. 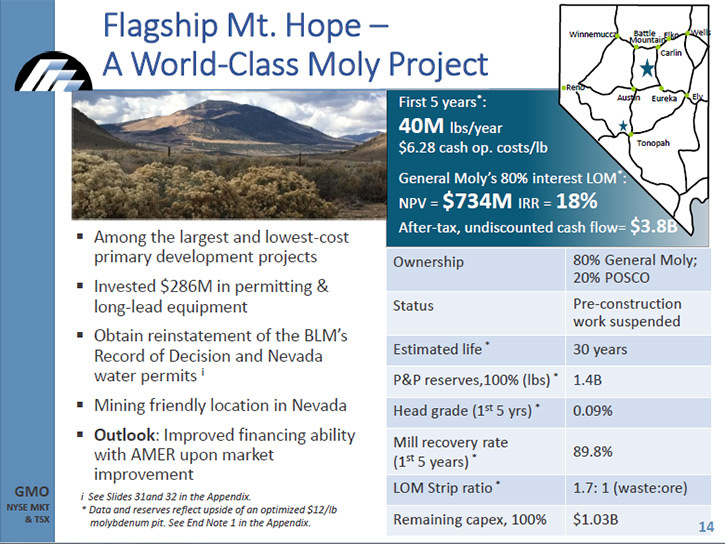 Hope project located in central Nevada, which is considered one of the world's largest and highest grade molybdenum deposits. 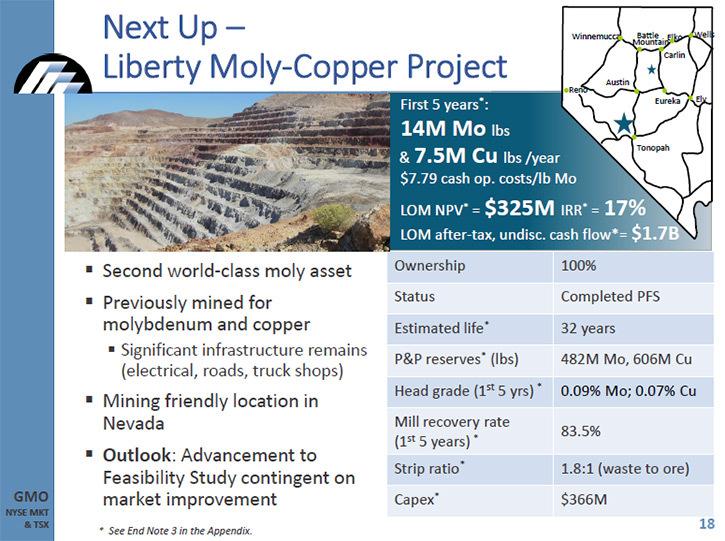 Combined with the Company's wholly-owned Liberty project, a molybdenum and copper property also located in central Nevada, General Moly's goal is to become the largest pure-play primary molybdenum producer in the world. We learned from Bruce Hansen, who is CEO and also CFO of General Moly, that the Mt. Hope project is on the lower end of the primary producer cost curve and has already attracted large strategic players in the steel industry. The Liberty project is an excellent follow-on asset that will produce about half the amount of moly as compared to the Mt. Hope project and will also produce by-product copper. Plans for 2018 include finalizing all required permits for the Mt. Hope project. According to Mr. Hansen, the moly market is improving over the long term and General Moly is the go-to story in the moly space. Dr. Allen Alper:	This is Dr. Allen Alper, Editor-in-Chief of Metals News, interviewing Bruce Hansen who is CEO and also CFO of General Moly. Bruce, could you give our readers/investors an overview of General Moly? Bruce D. Hansen:	Most certainly, Allen. General Moly is a molybdenum development company. We have two primary assets, both of them located in Nevada; the Mt. Hope project, which is one of the largest undeveloped projects in the world, initially discovered by Exxon in the late '70s, early '80s and the Liberty project, in the town of Tonopah. It was previously mined and developed by Anaconda. Then, it was also operated by Cyprus. Most people know it from its prior name as the Hall-Tonopah project. I think we're currently the only pure play, publicly traded moly entity out there. A lot of other development companies that were focused on moly have either fallen off the map, been taken private, or been absorbed into other entities. We think the moly market's improving over the long term and General Moly is the go-to story in the moly space. Dr. Allen Alper:	That sounds great. Could you say a bit more about the two properties you own and what differentiates them from others? Bruce D. Hansen:	The key differentiator in regards to the Mt. Hope project is its long-term cost structure. Once we're up and running, the operating costs for the Mt. Hope project on a cash cost basis should be somewhere in the lower $6/pound range. When we look at the global cost curve, it puts the Mt. Hope project on the lower end of the primary producer cost curve. The other important aspect of Mt. Hope is the endorsement given to the project and to General Moly through large strategic players. POSCO, the Korean steel company, is a direct 20% owner in the Mt. Hope project. We also have offtake agreements to supply moly out of Mt. Hope for the first five years with Arcelor Mittal, Sojitz and SeAH. Our primary focus is on moving forward with the Mt. Hope project, where we've already invested close to $300 million. And the Liberty project is an excellent follow-on asset. It will produce about half the amount of moly compared to the Mt. Hope project and will also produce byproduct copper. It's 100% owned by General Moly. It's on care and maintenance. Liberty is not as advanced from a feasibility study perspective or a permitting perspective, but we see it as an ideal follow-on opportunity, post development of Mt. Hope. Dr. Allen Alper:	Sounds excellent. What are your plans going forward for the rest of 2017 and 2018? Bruce D. Hansen:	We have two priorities. The first is to continue to advance the efforts related to the Mt. Hope development, which is driven by our getting two primary permit issues resolved. One is getting a full Record Of Decision from the Bureau of Land Management (“BLM”) on the Mt. Hope project through completing a supplemental Environmental Impact Statement (“EIS”) as a result of a decision from the Ninth Circuit U.S. Court of Appeals that related to air quality modeling. Those efforts are moving along. The BLM has issued its Notice of Intent to proceed with completing a supplemental EIS. We're working with the BLM to finalize the administrative draft of the supplemental EIS. Once that's ready, we will work with the BLM to publish its Notice of Availability, which advises the public of the opportunity to review and comment on the supplemental EIS. Upon completion of a final approved supplemental EIS, we anticipate we'll ultimately receive a new Record of Decision from the BLM approving the supplemented EIS and plan of operations for the development and operation of the Mt. Hope project probably sometime in the first half of 2018. The other priority we're working on is the restoration of our water permits associated with the Mt. Hope project. We have a set of pending applications in front of the Nevada State Engineer, who manages water permitting in Nevada, in order to convert our water rights from agricultural to mining use and to change the point of diversion for locating of wells. Following a hearing before the Nevada State Engineer, where we expect to demonstrate our ability to alleviate potential impacts to senior water rights in the basin, an issue with our prior permits and the Nevada Supreme Court, we anticipate receiving our new water permits during 2018. The project is already 65% engineered from a design and procurement perspective, and then it's a matter of the moly market. If we can see plus $12 moly in the near future that will drive our financing efforts. Fortunately, we have good support from our largest shareholder. 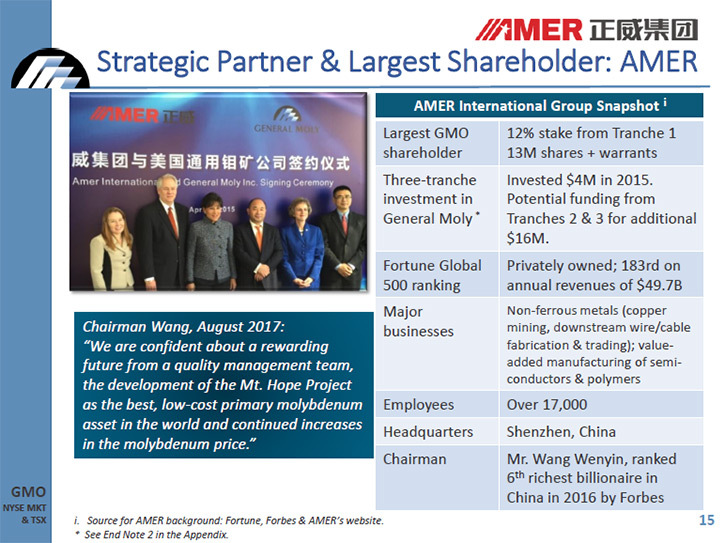 It's a private Chinese group called AMER International Group. 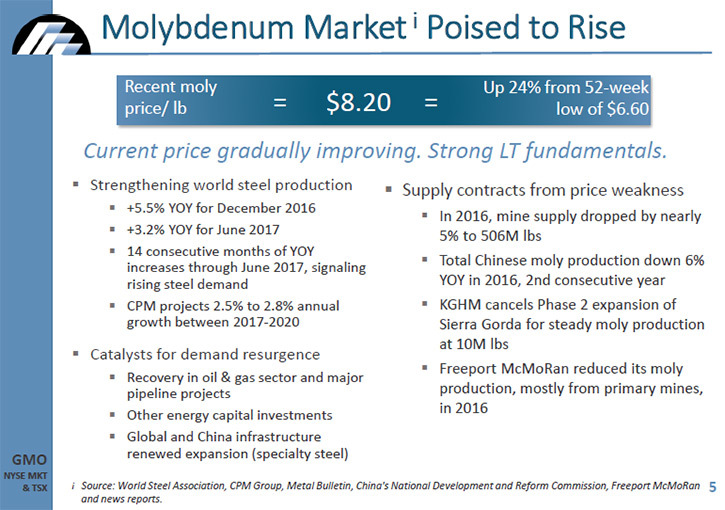 Once the moly price increases to approximately $12/pound, we'll be working with AMER to obtain up to $700 million of a Chinese bank loan to help fund our share of the Mt. Hope project’s development costs. In the interim, as we pursue these permits and track the gradual moly price recovery, we're working with AMER as we collectively evaluate other opportunities that General Moly and AMER could potentially acquire jointly, primarily in the base metal space, as well as in the ferro alloy space. We've been actively bidding on and evaluating a number of properties last year and so far this year. Dr. Allen Alper:	Sounds great. 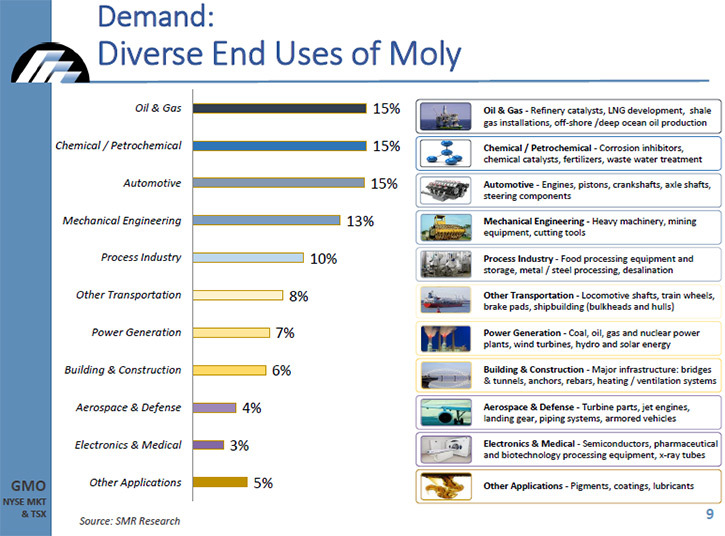 Could you explain to our readers/investors why moly is so important as an additive? Bruce D. Hansen:	Moly is a key additive to steel and specialty steels in regard to principally its ability to enhance steels to combat corrosion. It also enhances the strength of steel in extreme high-temperature environments. It helps reduce thermal creep. Moly is used in a wide range of steel applications, but I would say probably the most important application is in reducing the potential for corrosion in steels. Therefore, it's widely utilized in the oil and gas sector and the chemical petroleum refining sector where you have hydrocarbons with small degrees of sulfur that converts into sulfuric acid and can erode and corrode steels that don't have an additive like moly. We're very encouraged in what we're seeing in terms of the recovery in the oil and gas sector and particularly in the various developments we see on the horizon in the natural gas and liquid natural gas sectors worldwide. Dr. Allen Alper:	Sounds excellent. What is the outlook for the moly market going forward? Bruce D. Hansen:	I think we've already seen some degree of improvement in the moly market, starting the year in the $6.50/pound range. Currently, we're around $8.50/pound. We see a gradual improvement over time, driven by an increase in both global and specialty steel production in the U.S., the recovery in the oil and gas sector that drives a lot of the high-strength, low-alloy steel production, and also in expansion of global LNG processing and transportation via ships and pipelines. We work closely with a metal econometrics firm called the CPM Group. 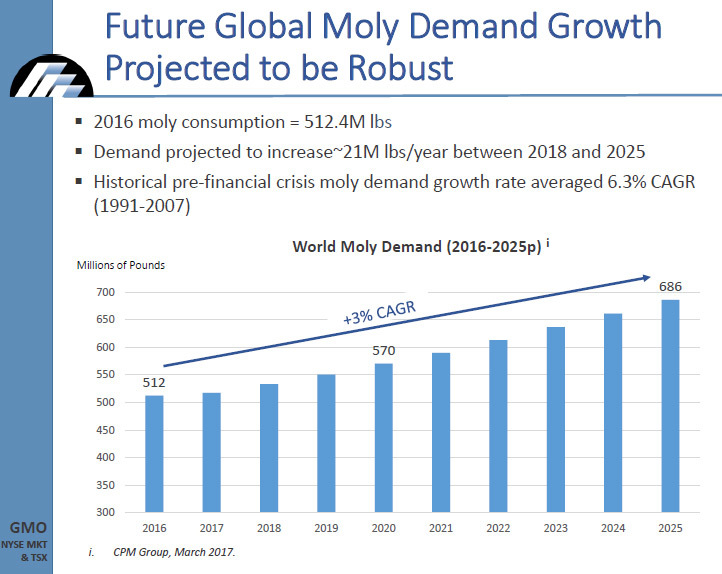 Looking at their projections, it shows a continual, gradual increase in the moly price over the next five years, getting to something in excess of $13/pound by 2020. Hopefully, we'll see that increasing at a more rapid rate. I think there are clearly opportunities for that, again, because I think demand has been more robust than what they initially projected. They also have indicated that byproduct moly production coming out of the copper industry is scheduled to peak at the end of 2018. So we feel that there's a need for primary moly projects like Mt. Hope to enter the market in the 2019, 2020, 2021 timeframe. Dr. Allen Alper:	Sounds great. Once you have your permits and the market looks like it's a go, how long would it take you to build your plant and start producing? Bruce D. Hansen:	Our construction time ranges anywhere from 24-30 months. It really depends on when we get started vis-a-vis the weather cycles and the time to reassemble an engineering team. If we start where we're dealing with two summers and one winter, and can get a jump on engineering by several months, this combination would be ideal. Dr. Allen Alper:	And it sounds like you're getting your financing in place. Bruce D. Hansen:	We have good solid support from our Chinese partner, and financing will depend on an improved moly market, but we're seeing that improve over time. AMER is also very interested in taking some offtake that we have not yet committed to other partners and bringing that into China. Dr. Allen Alper:	Excellent. I know you have an excellent background Bruce, but could you tell our readers/investors about your background and that of your team and board? Bruce D. Hansen:	Sure. Let me talk first about some of our key team members. I think probably most important is our Chief Operating Officer, Bob Pennington. Bob's been with us since 2007. He formerly was the Chief Operating Officer for an engineering construction firm called M3 Engineering that focuses on mining projects. . Before that, Bob spent 16 years with Phelps Dodge, building and operating large scale copper and copper moly projects in Arizona and New Mexico and down in Chile with the development of the Candelaria mine. In terms of my own background, I'm a mining engineer. I graduated from the Colorado School of Mines. I also have an MBA in Finance. I have had roles throughout my career in both the technical side of the business and the financial side of the business. 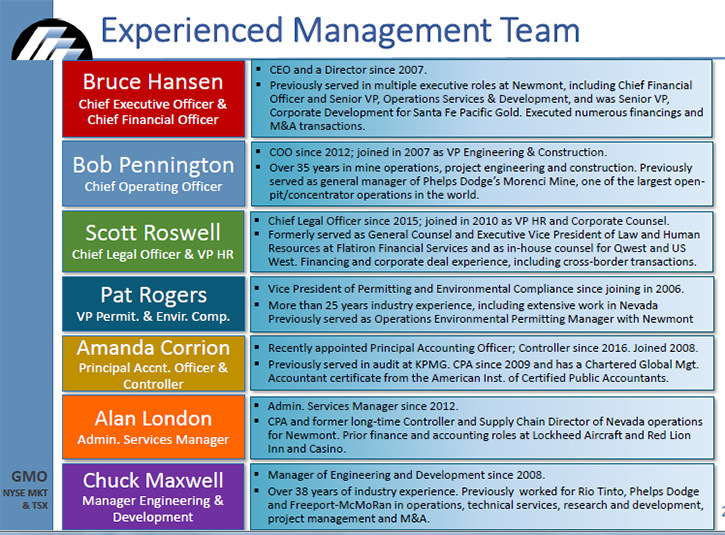 I'm the former Chief Financial Officer of Newmont Mining where I was the CFO for about five years. My other job, when I was at Newmont, was more in the technical project development and engineering construction area. I've been with General Moly since 2007. The focus has been on feasibility, permitting, financing throughout our timeframe here, and we think we're on the cusp of a moly market improvement going forward. In terms of our Board of Directors, we have Tong Zhang, who’s a representative of AMER International on the board. He heads up AMER's international investment arm. Ricardo Campoy, a practicing investment banker, is our Chairman. He works for a boutique investment banking firm called Headwaters. The Chair of our Audit Committee is Mark Lettes, who is the former CFO of Apex Silver, and before that, he was CFO of Amax Gold. Gary Loving is on our board. He's a former mining executive, previously with Homestake and Phelps Dodge. Before he retired, he was CEO of Frontera Copper that developed a copper project in Mexico. Greg Raih is also on our board. Greg is a former audit partner, most recently with KPMG and previously with Arthur Andersen. I knew Greg when I was the Chief Financial Officer for Newmont and he was the audit partner representing Arthur Andersen at that point in time. We have a very solid, well-seasoned team and board, and we're well-poised for the upward turn in the moly business. Dr. Allen Alper:	Sounds great. Sounds like you have a very strong board, a very successful board, and a very knowledgeable board, and also your background is extremely strong and accomplished. 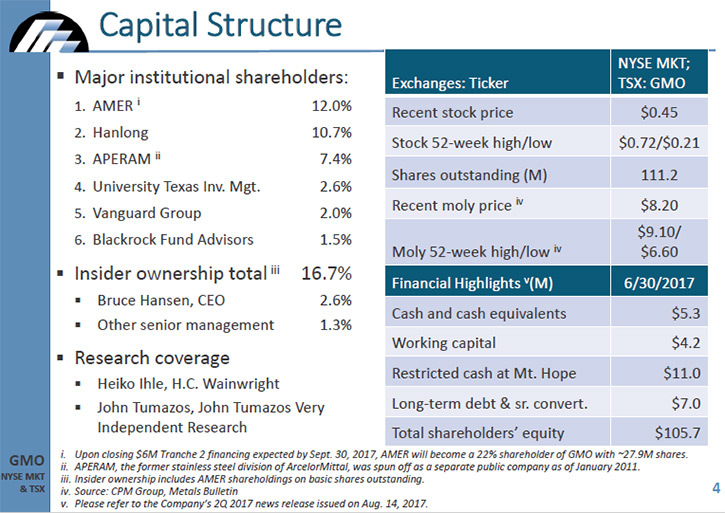 Could you tell our readers and investors a bit more about your capital structure? Bruce D. Hansen:	Currently, we have a market cap of around $50 million. We have just a small amount of debt, about $7 million of convertible notes. The largest owner of those notes is Steve Mooney, who formerly was the owner of Thompson Creek Metals before it was acquired by Blue Pearl. Then its name was restored back to Thompson Creek Metals. He's the largest debt holder in the capital structure. I own about $1.1 million of those notes, so I'm the second largest debt holder. I also own 2.9 million GMO shares for 2.6% of General Moly, including my early October 2017 purchase in the market of 20,000 shares at $0.37 per share. Current cash as of the end of the last quarter was about $5.3 million. In our relationship with AMER International, they've committed to an additional private placement of $6 million, which we anticipate to close in the middle of October. Based upon certain conditions, they've committed to fund another $10 million, once we get our water permits restored or we execute on an acquisition with them where we issue more than 10 million General Moly shares. Dr. Allen Alper:	Sounds very good. What are the primary reasons our high-net-worth readers/investors should consider investing in General Moly? Bruce D. Hansen:	We think the general outlook for moly demand and ultimately future moly pricing is extremely positive. We see continued increase in global industrial expansion and global steel production and, more importantly, in specialty steel production, primarily related to the oil and gas sector. 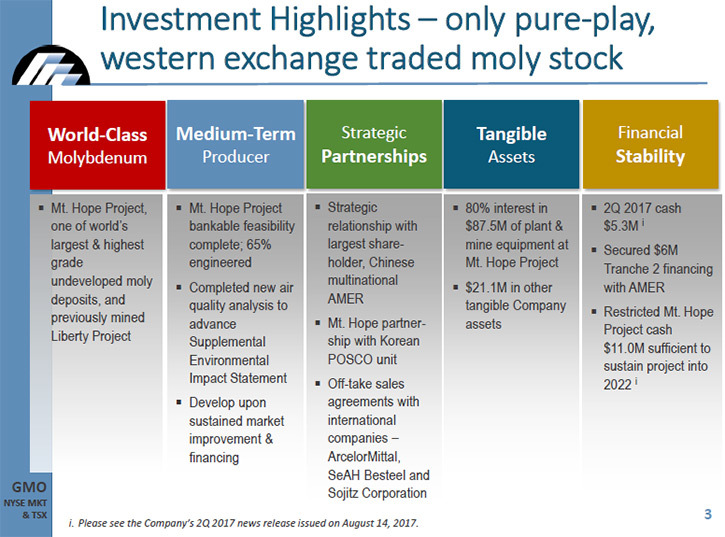 Frankly, we're the only pure play moly investment vehicle out there, so when we see moly rise, we're going to be the go-to story in the moly space. Dr. Allen Alper:	That sounds very good. Bruce, is there anything else you'd like to add? Bruce D. Hansen:	Just to thank you for the opportunity to talk with you about General Moly.